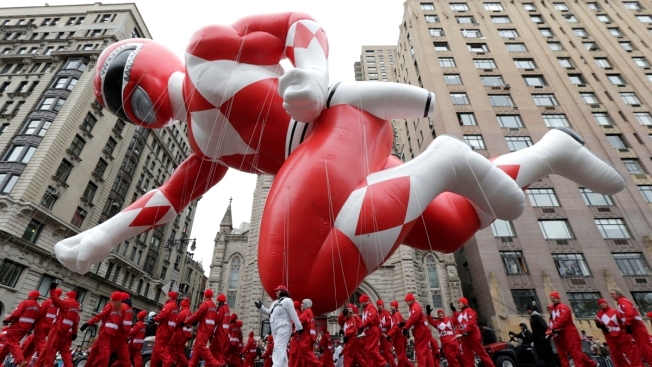 A Power Ranger balloon makes his first time appearance along Central Park West during the Macy's Thanksgiving Day Parade, Thursday, Nov. 27, 2014, in New York. A Florida man dressed as the Red Power Ranger was arrested near a Tampa public pool following reports that he pointed a gun at someone and made a threatening statement, authorities said. Officers responded to a 911 call at the Bobby Hicks Pool Thursday afternoon and found 24-year-old Justin Duarte of Tampa in his mighty morphin' outfit, preparing to drive away, police said. Officers reported finding two realistic looking fake handguns after searching Duarte. They bore no resemblance to the blade blasters, thunder slingers or other fanciful side arms that typically appeared on 1990s television series "Mighty Morphin Power Rangers" or its later spinoffs and films. Duarte was arrested and charged with aggravated assault. Jail records didn't list an attorney.